Pinched nerves are serious injuries any way you look at them. Nerves carry vital information from our brains to the rest of our bodies whether in regards to our basic motor function (everyday tasks) or sensory information. When a nerve is pinched, it means that it is damaged by compression or direct pressure which delays or severs the flow of information to and from the brain. If too many nerves are pinched, the result can be quite catastrophic. Imagine losing your sense of smell or the ability to pick something up with your hand. Pinched nerves can be caused from many different situations, from sleeping the wrong way or from auto accidents. And pinched nerves don't just happen in the back or along the spine, they can happen anywhere in the body and can leave the person with severe pain or no pain at all, but if left without care, a pinched nerve can easily become a bigger problem. Many chiropractors may recommend taking it easy and lots of rest for the area affected by the pinched nerve(s). While other physicians may recommend prescription drugs, splints or special collars to protect the injured areas, a chiropractor's advice reigns supreme: lots of rest. It is a less expensive alternative to costly hospital visits. In the case of an auto accident, a pinched nerve can happen in many locations: in the neck, back, wrist, arms, legs. 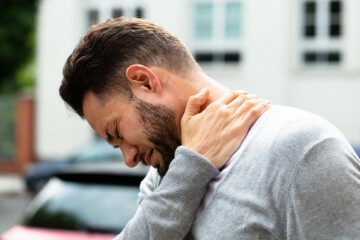 If you suffer from a pinched nerve, see a chiropractor immediately so he can assess the situation, and begin a treatment program that will relieve the pain and realign the surrounding bones and tissues so that the nerve can regain its natural function. When a nerve is damaged or injured by direct pressure or compression and is unable to work properly, it is called a pinched nerve. If a nerve is pinched in the lower back or neck, it may be due to stress from a car accident. Symptoms of a pinched nerve include numbness, "pins and needles", and burning sensations around the pinched nerve. Pinched nerves can often lead to more serious ailments including carpal tunnel syndrome, tennis elbow, a loss of sensation in the area of the pinched nerve and an inability to control ones' muscles which can cause coordination malfunctions.